My 1st teaching day after my chemotherapy within a week. I still felt fatigue and I was nauseous in the morning. I took an anti-nausea medicine and I felt OK. I was in bed until I really had to get up to dress for teaching. Thanks to my parents for preparing chicken and vegetable soup. Although, no taste to enjoy it, texture was good to eat. 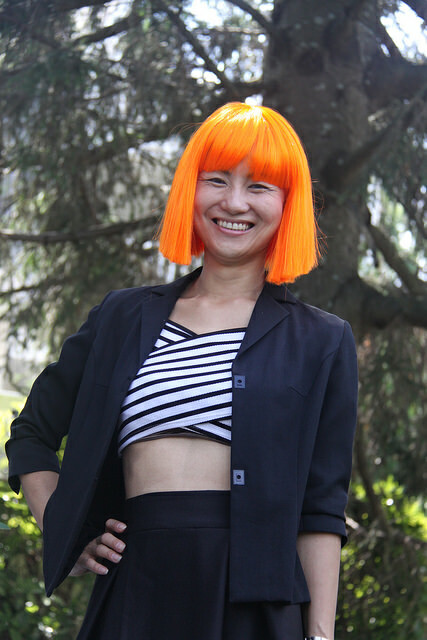 I put my cloth, then a choice of my wigs… Well, I might as well do as bright as I can! Putting makeup and putting my wig, I totally look like a girl a la mode! When my outfit completed “me,” my posture became great. I need to look proud how I dressed up. Fashion, give me power! I need it right now for teaching. So here I am, I look totally happy with how I am. I received a lot of complements all the time! People gave me big smiles as they pass me by. My colleagues thought I was just doing it for fashion and they really liked it a lot, and did not know my medical condition. So much fun. Those who knew my medical condition thought I pulled my outfit really well from head to toe. Teaching went well. I covered full course time, 2h and 40min. I was exhausted most of the time to walk around, but I just wanted to go around to communicate with my students to catch some issues they might have during class in exercises. Oh, I was nauseous. A way back to my home, a train ride was not pleasant. Full of people, I could find a seat to fit in. But I was nauseous all the day back. Once I am home, I washed my hands and cleaned my mouth well, I dived into a couch. I took another anti-nausea medicine. [physical] nauseous. I took anti-nausea medicine in the morning. No appetite, no taste. I was in bed or a couch as much as I could. [emotional] great! I just liked that there were moments that I was so confident of how I looked. It was fun. I am glad that the rest of the week, I will take a good rest.